Do not give up on your dream nose! 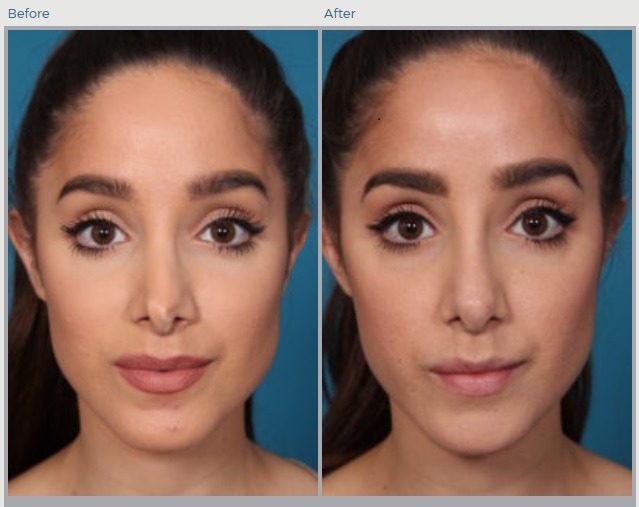 Whether it is performed for functional reasons or cosmetic, a “nose job” or revision rhinoplasty can bring symmetry and create a more attractive appearance by simply reshaping the nose. In Boca Raton, FL, and the surrounding communities, Daniel Man, M.D., a Florida board-certified plastic surgeon, performs rhinoplasty and revision rhinoplasty on individuals who want to reshape their noses or fix a previous rhinoplasty to balance their faces and improve their self-confidence. You are an Amazing Artist, Sculptor ad Surgeon!! Thank you so much for knowing and creating Exactly, the most perfect nose for my face. I love the look of it and can’t believe its still me. Im so happy and thankful, you are really the best. From the miracle transformation you made for my mother, to saving me when I became very sick with the lumps in my chest, I never had any doubt that one day you would be the surgeon who would change the look of my face. s if you went into my thoughts, you knew what I hoped to see. I had total confidence in you. Thank you again so much. I also want to say thank you to your amazing nursing staff. They were all so kind and caring to me every minute throughout the night. It made the experience more comfortable and I was so glad I stayed the night. I was even treated to a delicious smoothie in the morning. How wonderful is that. In fact, your entire staff has been totally gracious, thoughtful and helpful from the first day I came to the office. They all are a pleasure to speak with help in every way. What a great experience!! Rhinoplasty, more commonly called “a nose job”, is a surgical procedure used to reshape, contour, and adjust the proportions of the nose. Revision Rhinoplasty, or “Secondary Rhinoplasty,” can address unwanted results or complications after an initial rhinoplasty. This procedure is performed to fix a rhinoplasty surgery gone wrong or revisit the rhinoplasty procedure to fulfill the patient’s desires. A rhinoplasty can straighten the bridge of the nose, reduce a bump on the bridge of the nose, alter the size or shape of the tip, or narrow the base of the nose or nostrils. This procedure may also be a functional procedure to correct breathing difficulties due to blocked nasal passages (deviated septum). It is done by working inside the nose and nostrils to separate the outer skin from the underlying bone and cartilage. The nose is then contoured to a more desirable shape. If you are unhappy or dissatisfied with a previous rhinoplasty or continue to have breathing issues due to structural issues of the nose, you may want to consider revision rhinoplasty to achieve the appearance you’ve always desired or correct further breathing problems. How Involved is a Revision Rhinoplasty? A revision rhinoplasty procedure is different with each patient, as each patient’s nose is not the same and the doctor doesn’t know what to expect when revisiting a prior rhinoplasty procedure. During the procedure, the incisions are made either inside the nose (closed procedure) or across the narrow strip of cartilage between the nostrils, which is called the columella (open procedure). Dr. Man prefers the open procedure whenever possible. Once the incision is made, the skin is lifted to provide access to the tissue. At that point, Dr. Man has access to the interior of the nose to reshape the nose and remove excess bone and cartilage. Depending on the purpose of the rhinoplasty, excessively large noses require the removal of bone and cartilage while a deviated septum may be straightened to improve breathing. For those with a hump in the center of the nose, bone is shaved to remove the hump. Once the structural elements of the procedure inside the nose and any aesthetic reshaping are complete, the skin of the nose is re-draped in its proper place and sutures close the incision. The rhinoplasty procedure takes roughly one to two hours, but may be longer for more extensive reconstruction. A revision rhinoplasty procedure can also take less time depending if it is just a quick fix that is desired by the patient. The surgery is performed in the doctor’s office under local or general anesthesia. After the procedure, patients rest comfortably until the anesthesia begins to wear off. Any necessary medications are administered to prevent infection and minimize discomfort. A tape (acting much like a splint) is worn for several days. It is imperative for patients to have someone stay with them for the first 48 hours after the surgery. If necessary, patients may stay overnight at our center the first night following surgery to receive care during that time. Our nurses are all ACSL certified and our facility has specialized recovery options. This includes chest wall cooling methods to reduce pain and swelling, a hyperbaric chamber, and oxygen treatments to speed healing. How Is the Recovery from Revision Rhinoplasty? The first week requires much rest to allow the nose to heal. After one week, the splints are removed. Depending on the severity of the revision and what is being fixed from the previous rhinoplasty, a splint may not be involved. Dr. Man uses special methods to decrease swelling and black and blue discolorations around the nose and eyelids during and after surgery. With every passing day after surgery, the swelling decreases and results improve. Patients feel no pain due to Dr. Man’s advanced recovery techniques. The cost of a revision rhinoplasty varies, just as each procedure varies with each nose. It is based on the procedure, what needs to be fixed, and whether it is performed in conjunction with other procedures. Dr. Man goes over the cost with each patient during a consultation, as well as payment options and financing. Health insurance may provide coverage depending on the purpose of the procedure. If you are unhappy with an initial rhinoplasty that was performed, the shape of your nose, or if you are still having functional problems, we recommend scheduling a consultation with Dr. Man. During this consultation, he talks with you about what you want and evaluates your nose and your concerns. At that point, he makes a recommendation and discusses what he would like to do in detail, so you can make an informed decision about it. He also answers any questions you may have. Florida board-certified plastic surgeon, Daniel Man, M.D., performs revision rhinoplasty on the residents of Boca Raton, FL, and the surrounding communities who do not like the shape of their nose or have issues with breathing after a previous rhinoplasty. Please contact us to set up your consultation today.